Changes to this yearâ€™s student handbook regarding attendance, tardy issues, and the communication over those changes has led to increased student frustration over resulting disciplinary consequences. 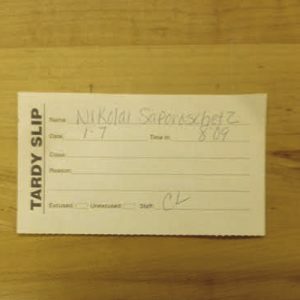 Hopkinton High School has implemented a new tardy policy for the 2014-2015 school year, now allowing only 5 tardies. Photo by Nikolai Saporoschetz. This past summer new education laws were implemented by the state of Massachusetts. The laws involved school attendance as well as suspension and expulsion. As a result a large portion of the student handbook was rewritten, changing some of the school’s policies. This includes the tardy policy; the change included allowing students only five tardies as opposed to the previous six. The school also no longer accepts notes from home, only doctorsâ€™ notes can be accepted as an excused absence now. â€œThe Hopkinton High School student handbook states that on a students 6th tardy of a semester they will receive a detention. For every subsequent tardy the student will receive a detention. On the eighth tardy the student will be notified by the assistant principle and will receive a Saturday school,â€ said second year Assistant Principle Joshua Hanna. Although this is the policy at the school, a surprising number of students are unclear of what the rules really are. â€œI heard that if you’re late seven times then you get an office detention and on the ninth you receive a Saturday school,â€ said sophomore Will Pickens. When told of school changes in the tardy policy students had no idea about what the current policy was or what was changed.â€œI didnâ€™t know that they changed any rules about the tardy system because putting that in the student handbook is not the best way of letting the students know about the changes, in my opinion,â€ said Pickens. Joshua Hanna, 2 year Assistant Principle, states administration encourages suggestions to better the education of the school’s policies. Photo by Nikolai Saporoschetz. The administration does follow a procedure for informing students of school rules.Â â€œEvery student receives a slip of paper which both they and a parent sign saying they read the student handbook. However, the handbook is very long and I understand people wanting to know changes which affect them. If any students have any suggestions about better ways of informing people about the rules, they are encouraged to make suggestions,â€ said Hanna. In addition to the lack of understanding of the policy, students are frustrated about the severity of consequences. The school however does not use the consequences solely to punish, but also to teach lessons which will extend far beyond the classroom. â€œI find the policy to be fair in a way because it is important to be on punctual and time management is an important skill to have. 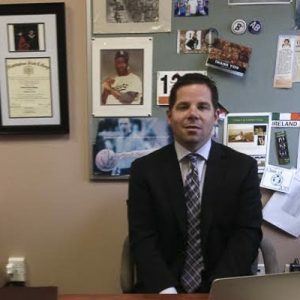 If you look beyond the rules you realize that the greater philosophy is to emphasize the importance of being on time, which will help students in the future,â€ said Hanna.